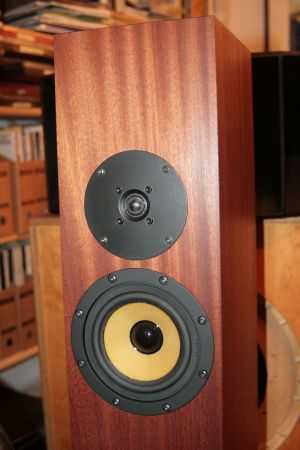 Product name: Blumenhofer Fun 13 loudspeakers. When I visited Blumenhofer Factory in January, I liked their small Fun 13 very much. So Andrea Vitali and I agreed to have them reviewed. The Fun 13 has a high but small and slim cabinet, with its bass horn opening firing down to the floor. 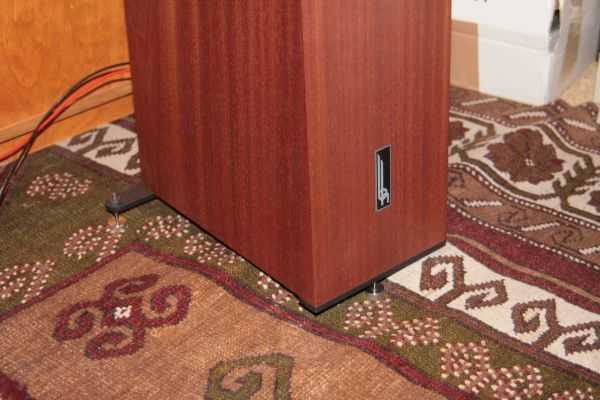 It was the only Blumenhofer speaker made from fibreboard at that time. Later the Fun 10 has been added to the product range, priced at below 2000 EUR, also made from fibreboard. The other speakers higher up in the product range are made from plywood, though. Then the Fun 13 is also made from stock drivers, while the higher positioned speakers all have custom drivers. In fact, the Fun 13 sports a 5 inch hexacone sandwich woofer and a 19mm silk dome tweeter from Eton, a German high-end speaker driver manufacturer. 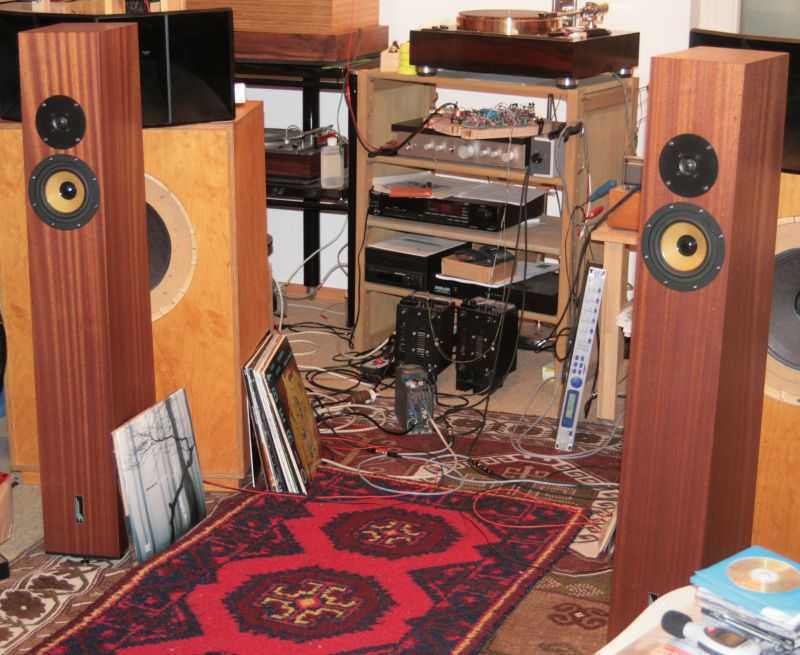 With all these aspects, Blumenhofer has set up an entry level model, still produced in his workshop in Germany, with German parts, but also affordable to the high end audiophile on a budget. Indeed, the Fun 13 looks more like a LS3/5, where the space usually used for stands has been used for the bass horn. Bass horns in a standard two-way combination is not something new. I remember the Impulse speakers from Great Britain, a company, which had a complete line of horn speakers using Focal and Seas drivers. There had also been the Triangle TQWT with 17cm fullrange driver and Technics horn super tweeter in the 80ies. I still remember student parties with a two way Schmacks bass horn loudspeakers. My general impression was that horn installations do give a lot of fun, but might sound not that balanced most times. It was the balanced and neutral sound of the Fun 13, that I heard during my factory visit, which let me really want them for review. In my setup I have active horn loudspeakers, with three pair of power amplifiers, 30W/ch transistor for the bass, and 5W/ch single ended tube power amps for mid and treble drivers. For listening the Fun 13, I first chose the 6BC5A tube amps I had for midrange, because those are the best in my setup, soundwise. Surprisingly, it worked from the first moment. It was not as look-through clear in the mids like my Altec 802 with LeDauphin sand-filled midrange horn, nor as fine in the treble as my Goto horn tweeters. Also the bass was not as structured as with my open baffle 12 inch bass, but it came quite close to that. The tweeters did not make my ears bleed, on the contrary, I found treble a bit soft. I was astonished to find the presentation even more balanced as with my usual setup. I guess this is due to having three different power amps each adding its own signature to the active setup. Despite moderate efficiency, I could hear loud enough with the Fun 13 that I had to shout to visitors coming by, when playing full scale classical music. But normally, I listen at levels around 80 to 85dB, as I am fortunate to have a very quiet listening room. These Fun 13 can sound bigger than their physical presentation might suggest, be warned. I replaced my own speakers for some weeks with the Fun 13, but I adopted quite fast to those. Occasionally, I missed the immediacy that midrange and treble horns can deliver, but then I also enjoyed the smoothness, and that "I am not standing in the way of music" character of the Fun 13. There was no preferred genre that the Fun 13 liked better than others. Rock, pop, songwriters, classical, Jazz, what you throw at the 13, it can deliver. Well, with just one exception: party remixes, like Jazzanova, with their deep deep full throttle bass impulses, those stuff need different loudspeakers. BTW, that should have been clear just from looking at the Fun 13. I have a small complaint on the reproduction of acoustic bass notes. While these are well structured, sometimes the tone has a boxy flavour, when driven with my non-feedback single ended triode amplifier. Having said this, the bass reproduction is still better than delivered from usual vented box designs. When I replaced the single ended tube amp with my transistor amp, the sound got sharpened all over the range, the softness in the treble went away, and bass and also reproduction of acoustic bass notes got better too. But the music and inner detail had been still better with the tube amp. I took some measurements using ARTA and LIMP software and M-Audio USB Transit audio interface, Behringer ECM8000 microphone and a suitable microphone amplifier. The microphone was situated exactly one metre before the speaker vertically aligned with the tweeter. Before taking the measurement, the setup had been calibrated with a Bruel+Kjaer reference signal. 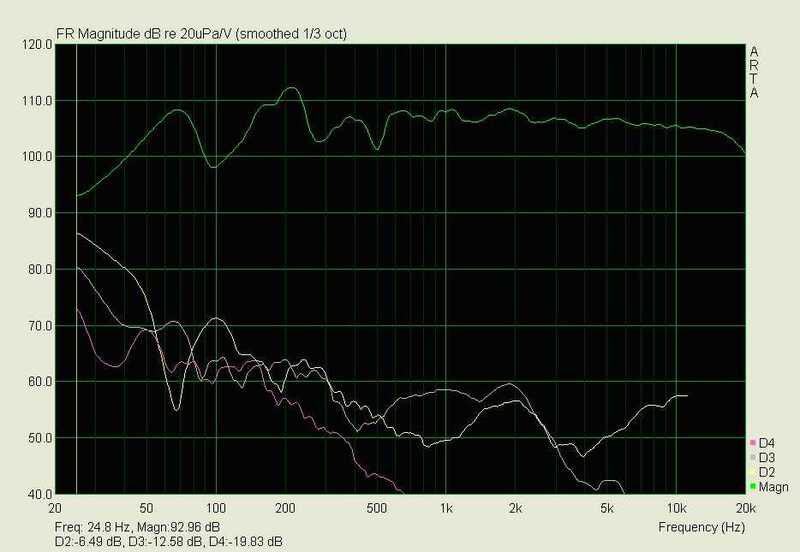 The frequency response (green line) is remarkably smooth. Bass goes well down to 60Hz and falls in level below that mark. This is no wall shaker, but that means you can use such a loudspeaker in your appartment without upsetting your neighbours. Please note that irregulatrities like seen in the bass to mid region are due to the ups and downs of the room itself, and can be found whatever speaker I measure in this room. What is really fascinating, is the low level of distortion in the bass region. Even at more than 100dB at 60 to 100Hz, the harmonics are just in the 1% region. In the measurement 2nd harmonic distortion can be identified by yellow line, 3rd harmonic by grey line, and 4th harmonic by magenta line. 40dB difference means a 1 to 100 ratio, or 1 percent. 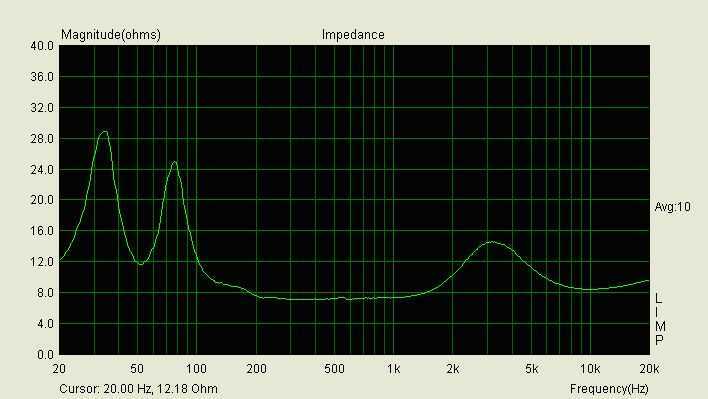 Usually, 5 inch drivers used as woofers in two way speakers have more than 10% distortions at a lot lower volumes of 90dB, and never can reach levels of 105dB. In a hornless speaker, it takes a a third way to meet the bass performance of the Fun 12. You likely need something like a big 10 or 12 inch woofer, with all its added complexity. With big woofers loudspeakers cannot look elegant any more and wife acceptance factor is compromised. Taking a horn is a really clever idea from this point of view. Also obvious is the tweeter going down a very tiny bit at 20kHz, which guarantees smooth silky detail without shouting or listening fatigue. This is not common for modern speakers. A lot of hifi loudspeakers are indeed voiced a bit "hot" in the upper treble region. I discussed this later with Andrea Vitali. He said that Blumenhofer had a first production run playing at some friends' homes, and as a result this was the generally preferred fine adjustment. As this is pure 8 Ohms speaker, it can be driven from all sorts of amplifiers. Tube amplifiers with lower damping factors change the frequency response a bit, though. While the Blumenhofer Fun 13 cannot compete with my own active horn loudspeakers, it is a gentle player, balanced like a British mini monitor, and sounds bigger than the small woofer might suggest. Its errors are more located in rounding and forgiving. I am glad that for this money, a speaker produced in Germany can be as good as the Blumenhofer Fun 13. It shows up the differences between transistors and tubes, and at the same time can play music well with both. It does not "stand in the way of music", and what else can one tell better on a loudspeaker in this price range.